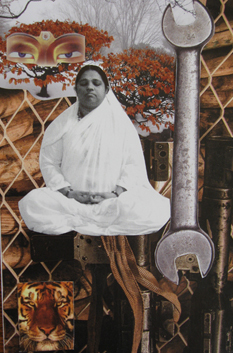 In May 2015, I began writing to an inmate through the organization Circle of Love Inside, founded by Mata Amritanandamayi, a renowned humanitarian affectionately known as Amma (Mother), or The Hugging Saint. I had heard of the program from a friend who had been writing to inmates for five years and enthusiastically endorsed it. I was looking for way to serve, and I had been concerned with the problems associated with mass incarceration in the United States for some time. Yet, I had no idea how powerful this simple form of service could be. What is Circle of Love Inside? Circle of Love Inside is an outreach program designed to connect volunteers with incarcerated individuals throughout the United States. Inmates request a pen-pal with whom they can establish a supportive and uplifting relationship through the simple, yet profound, act of letter writing. It is not a dating service and the boundaries are clear–the purpose is to support and to inspire. Its purpose is not to proselytize or promote a specific spiritual teaching, and inmates of all (or no) religions participate. Yet, we are encouraged to share our stories and of course, spirituality can be an important part of the letter writing conversation. Today, when writing letters is a lost art and email and texting have become the vehicle for staying in touch, being a pen-pal can become a priceless opportunity. It came as a surprise to me that both writing and receiving snail-mail could be so rewarding. It had been years since I’d written a letter–but it brought back the excitement of waiting for a hand written letter in an envelop. Most importantly, getting to know an inmate as a human being has been an enriching and profound experience for me and for others I know. It can be a journey where both volunteers and inmates are able to bring spiritual gifts to a unique relationship with individuals who we would never have met otherwise. In many cases, prisoners do not have outside family or support. So, it’s gratifying to know that receiving our letters from the “outside” can make an enormous difference in their lives. So, what have I learned by being a prisoner’s pen-pal? I have gotten to know a human being who has been labeled by society as a “criminal.” But to me, he is a person of value with so much potential to grow. This young man, who is only 27 yrs. old, lives in a cell the size of a parking space without human contact. This is the form of torture prevalent in our prison system called “solitary confinement.” It is known for causing mental and physical harm that is irreversible. I have learned inmates should not be defined by their crimes and flaws–like the rest of us, they are humans embarked on one of the most challenging paths of existence–the human journey. I have learned our playing field in society is uneven and that makes a difference in what choices we will make. I have learned society needs to address the gap between the rich and the poor and stop ignoring the social issues that guarantee crime. Some of us have been born into poverty, or become mentally ill, or have been victims of severe neglect and abuse. Yet, I believe in redemption and in rehabilitation. I believe in healing. I believe we have a moral responsibility to treat lives as sacred. It is time we, as citizens of a country with more incarcerated individuals than any other country in the world, recognize the dark “shadow” of our society. We have to stop ignoring the the social inequality that often leads to despair and eventually to crime. Our prisons are filled with bright and talented individuals who are capable of being rehabilitated. My pen-pal writes poetry, draws, paints, reads books, meditates and prays. My eyes are now wide open to the struggles of those whose daily existence is so harsh I could not bear it for one day. I stare at the man in front of me. He parts his lips and asks, Why have you become my enemy? That was never my intention, I respond. But you’ve hurt me, your daughter, your brothers, sisters, and your mom. I stare at the man in front of me with nothing to say. He parts his lips again, Do you expect it to all just go away? I cast my eyes away from the man, wanting to hide. Look me in the eyes, or are you that full of pride? I finally turn and begin to walk away. I love you, I hear him say. I slowly turn to find tears rolling down the man’s face. I love you, but you can’t seem to to find your place. I’m lost but will find my place one day.